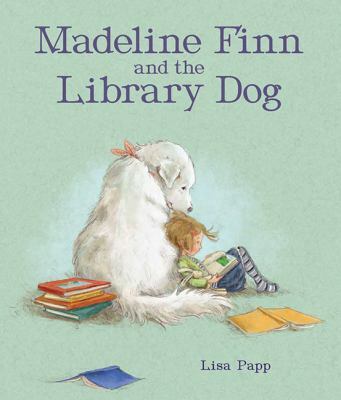 Madeline Finn and the Library Dog by Lisa Papp is a wonderful new picture book. Madeline Finn DOES NOT like to read. Not books. Not magazines. Not even the menu on the ice cream truck. But Madeline Finn DOES want a gold star from her teacher. Stars are for good readers. Stars are for understanding words. And saying them out loud. Fortunately, Madeline Finn meets Bonnie, a library dog. Reading out loud to Bonnie isn’t so bad. When Madeline Finn gets stuck, Bonnie doesn’t mind. Madeline Finn can pet her until she figures the word out. As it turns out, it’s fun to read when you’re not afraid of making mistakes. Bonnie teaches Madeline Finn that it’s okay to go slow. And to keep trying. Just like the sticker says. Did you know that the Everett Public Library has just such a program? 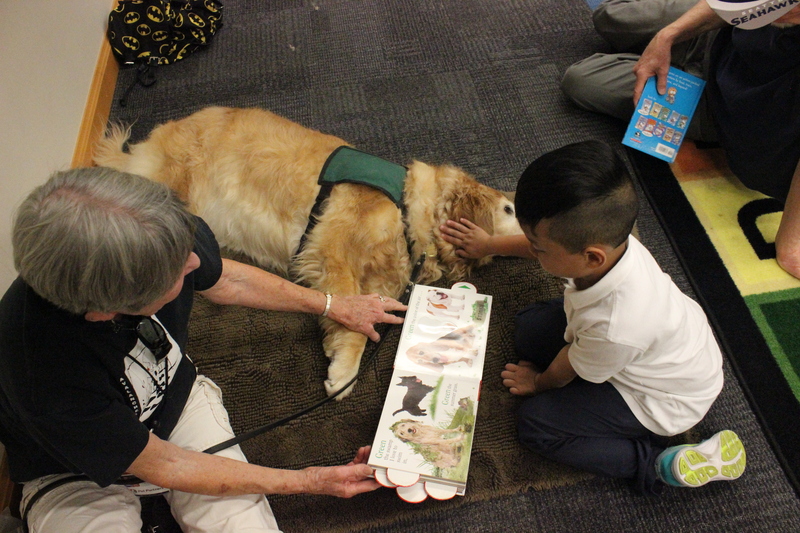 It’s called PAWS to Read and happens at the Evergreen Branch on Mondays from 3 to 5 PM and at the Main Library on Tuesdays from 3:30 until 5:00 PM. This program runs through December 13th, 2016, but will start up again in January. 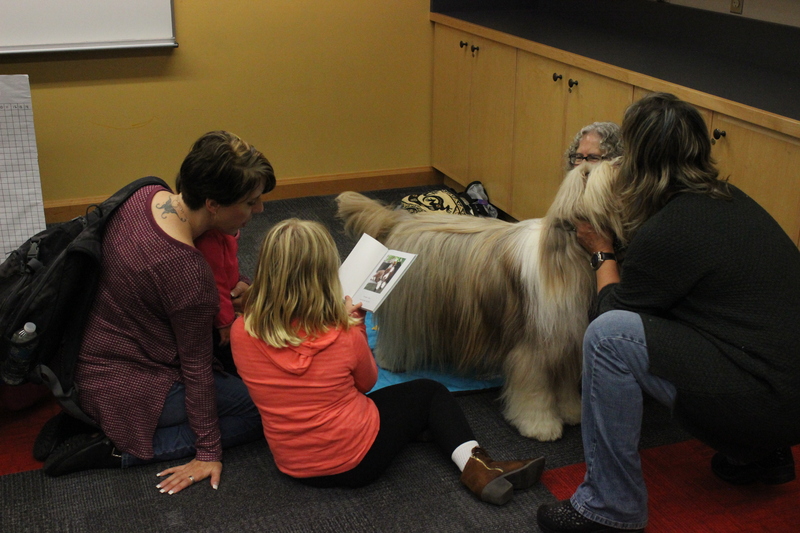 We have wonderful dog and human volunteers who come to the library faithfully each week to help our children learn to read. The dogs act as an incentive for the children to read more and to read better. Dogs are viewed as a non-threatening entity to promote reading, writing, and increased interaction and social skills in the child. As a result, children experience higher reading levels and higher levels of word recognition as well as word comprehension. The dogs used in this program are especially calm and unobtrusive and settle in as part of the class. The children view the dogs as lovable and non-judgmental, which are the keys to success in this program. Children report that the dogs give them confidence because the dog does not make fun of them if they read slowly or mess up pronouncing a word. 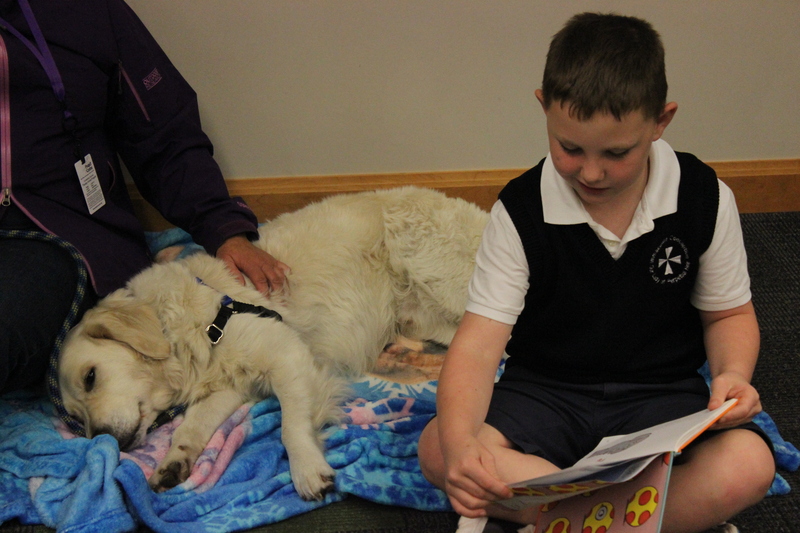 The dogs are great listeners and give the child a sense of comfort while reading. Children have been known to practice with their personal pets at home in preparation for the Paws to Read dogs. 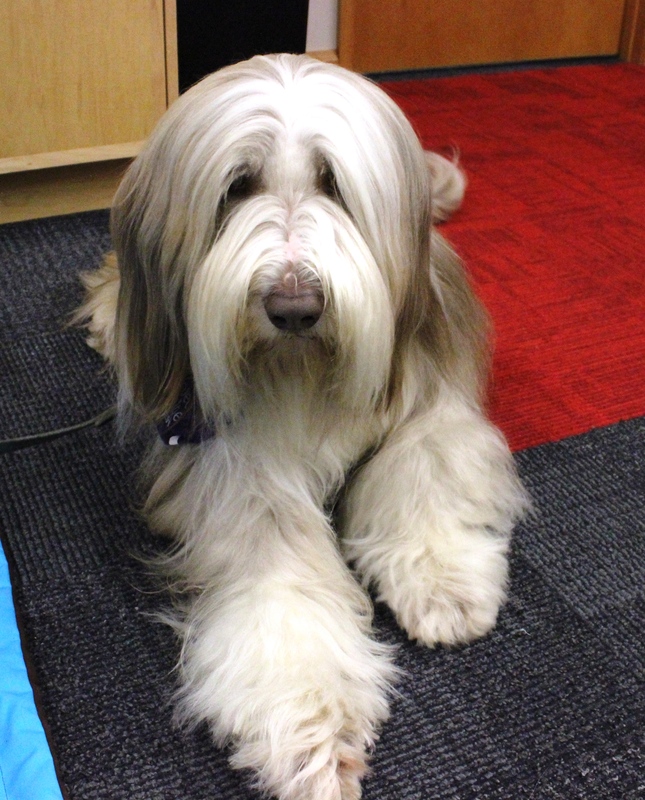 Come on down to the library just like Madeline Finn and meet our PAWS to Read dogs. They’re awesome! This entry was posted in Book Review and tagged Everett Public Library, PAWS to Read, picture books, reading by Leslie. Bookmark the permalink.